A good primer that isn't worth a fortune is hard to come by, Benefit's 'the POREfessional' (£24.50) is a really good one but can leave a slight dent in your bank account if you go through primers quickly! 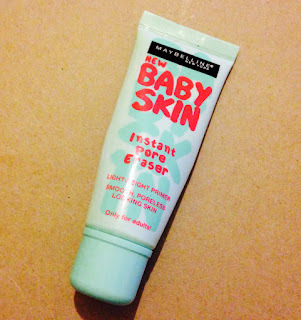 Then I read about Maybelline's Baby Skin instant pore eraser in Cosmopolitan and knew I had to try it. The first part of my make-up routine is to apply Garnier Moisture Match to hydrate my skin as it is often quite dry and then I use the Maybelline primer. It makes my skin feel smooth almost straight away and my pores look reduced! It works wonders and you won't be disappointed. My skin feels soft and looks great, and is ready for applying foundation.